On Wednesday, September 16, in damning detail, the East Ramapo Monitors presented their findings and actions thus far. The news that only 14% of our youth are leaving high school ready for college is only one of the chilling facts presented by the monitors. A webcast of the presentation is available on the Regents website (go to minute 23:30 for the beginning of the East Ramapo discussion). The monitors will be holding a community forum on Thursday, October 1 at 7 p.m. at the Cultural Arts Center, 64 N. Main Street in Spring Valley, the public is invited. Despite a rainy forecast (and some actual rain) over 100 people attended our Family Picnic. We had delicious food, great music, and honored some of the heroes of our movement. We also raised over $2,000 for Advocates for Justice! Pictures and videos are available at https://www.facebook.com/Power-of-Ten-222126104511971. If you missed the picnic, please consider making your donation to Advocates for Justice at http://www.advocatesforjustice.net/east-ramapo.html. Justice is coming, and YOU can make it happen! A new report by investigative journalist Adrienne Sanders of the Rockland Journal News blows open a previously unknown world of educational neglect in East Ramapo. Featuring riveting testimonial videos by former yeshiva students, Ms. Sanders details a story of shocking neglect of our most vulnerable population. 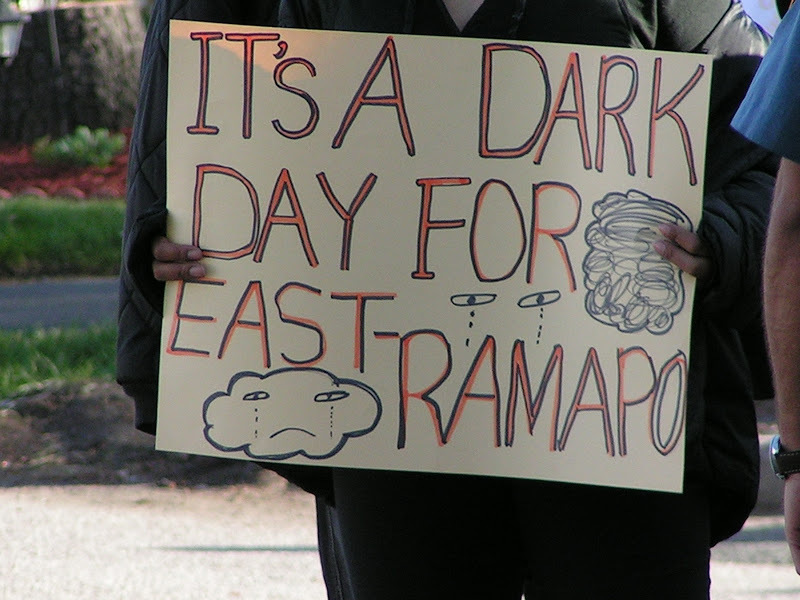 Most shocking of all is the complicity of the East Ramapo school administration, which is charged with preventing educational neglect and enforcing the truancy laws. Laura Barbieri of Advocates for Justice is also interviewed. A similar investigation is being conducted into education at NYC yeshivas, led by Young Advocates for Fair Education. The school district, despite having been cited by previous monitor Greenberg for failure to follow NY open government laws, and despite have subsequently received training from the Committee on Open Government, and despite the current presence of a new monitoring team, continues to redact politically embarrassing information from documents that the public has a right to see. Our educational tax dollars have been wasted on an unqualified an incompetent treasurer whose job was done at no cost to the district prior to his arrival. They have been wasted on a superintendent of schools who has zero cultural competence for the student body he serves and whose administration has received the lowest grade possible from the state education department. The Chancellor herself has called for him to be replaced. The board is supposedly “collaborating” with the new monitor team. If that is true, then the new monitor team is equally responsible for all that continues to be wrong with our district, or to publicly profess where the “collaboration” ends. If the treasurer is unqualified, and the board is responsible for continuing his paycheck, then any “collaborator” with the board is just as responsible. I think the public has been patient enough. Bier must go. Klein must go. We need a new vision for our children this year, before more irrevocable harm is done.